Why Did the Servants Present Lamoni with the Arms of His Enemies? “[The servants] went in unto the king, bearing the arms which had been smitten off by the sword of Ammon, of those who sought to slay him; and they were carried in unto the king for a testimony of the things which they had done” (Alma 17:39). Hugh Nibley observed, “The whole affair at the waters of Sebus must strike anyone as very strange.” Few details are stranger, perhaps, than envisioning Ammon’s fellow servants bringing a pile of severed arms to present to the king. Ammon had consciously “slew none with the sword save it were their leader” (Alma 17:38), but he “smote off their arms with his sword,” seemingly with a single blow (v. 37). The servants then diligently took the arms “unto the king … for a testimony of the things which they had done” (v. 39). One recent reader has proposed that “arms” should be interpreted as weapons, in part because “the image of a servant dragging a blood-soaked bag across the floor of the king’s palace in order to show him the gory amputated limbs of his enemies seems somewhat fanciful.” Yet, a pair of LDS scholars long ago noted, “The practice of cutting off the arms or other body parts of enemies, specifically as a testimony of the conquest of victims, is attested in the ancient Near East.” The severed body parts (typically heads or hands) would then be “sent on as evidence and trophies of the success” of a warrior in battle. Ancient depictions show soldiers “heaping them up in triumph,” in order to tally the dead or to entitle mercenaries to be paid. This was, according biblical scholars Cyrus Gordon and Gary Rendsburg, “a routine procedure all through the ancient Near East,” and “symbolized victory in battle.” Judges 7:25 and 8:6 indicate that the early Israelites engaged in such practices, which are well attested in Egyptian, Canaanite, and Mesopotamian sources. Switching over to the New World, in the Popul Vuh, the ancient traditions of the Quiché Maya, the mythic hero twins fight the bird-demon Seven Macaw. During the conflict, one of the twins attempted to grab Seven Macaw, “but instead Seven Macaw tore off the arm” of the twin, went home and “hung the arm” over the fire, “until [the twins] come to take it back.” This story is depicted on Izapa Stela 25, complete with hero twin’s severed arm, which dates to ca. 300–50 BC. Although mythological, the tale likely reflects actual Maya attitudes and practices in war and conflict. Like the ancient Near East, these Aztec and Maya sources portray the severed arms of an enemy as “a trophy of their valor.” The limbs are used to boast in one’s prowess as a warrior, taunt one’s enemies, and prove one’s bravery and achievements. In light of these ancient Near Eastern and Mesoamerican practices, the servants bringing the severed arms to King Lamoni as “a testimony” of the events they witnessed seems far less fanciful than at first glance. Instead, it would appear that “the astounded servants of King Lamoni, who took the arms that Ammon had been cut off into the king” were acting conventionally, according to custom.As one would expect, the pile of “war trophies” greatly impressed King Lamoni. He was “astonished exceedingly” to the point that he suspected Ammon was “more than a man” (Alma 18:2). The servants were convinced “he cannot be slain by the enemies of the king” (v. 3). With this background in mind, Ammon’s own words to his brother Aaron take on greater significance: “I do not boast in my own strength, … but I will boast in the strength of my God” (Alma 26:11–12). Ammon had ample opportunity to boast in his own strength after the episode at the Waters of Sebus. Instead, Ammon went about doing as he had been told, feeding the king’s horses, which further impressed King Lamoni (Alma 18:9–11). Bruce H. Yerman, “Ammon and the Mesoamerican Custom of Smiting Off Arms,” Journal of Book of Mormon Studies 8, no. 1 (1999): 44–47, 78–79. 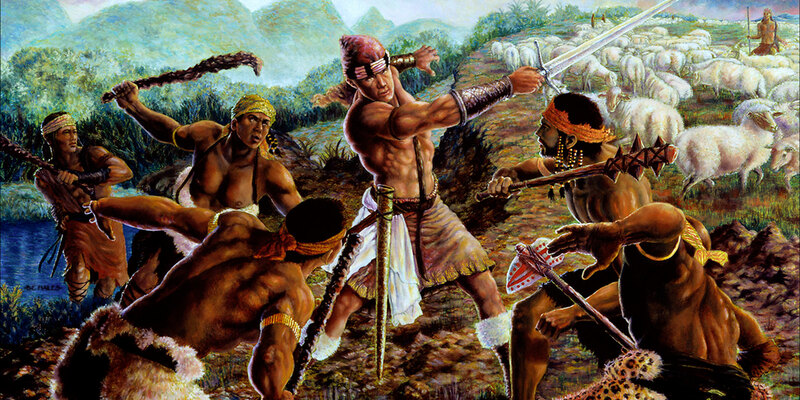 John M. Lundquist and John W. Welch, “Ammon and Cutting Off the Arms of Enemies,” in Reexploring the Book of Mormon: A Decade of New Research, ed. John W. Welch (Salt Lake City and Provo, UT: Deseret Book and FARMS, 1992), 180–181. Hugh Nibley, The Prophetic Book of Mormon, The Collected Works of Hugh Nibley, Volume 8 (Salt Lake City and Provo, UT: Deseret Book and FARMS, 1989), 539. See pp. 539–542 for Nibely’s discussion of this strange event in the context of Aztec sports. Brant A. Gardner, Traditions of the Fathers: The Book of Mormon as History (Salt Lake City, UT: Greg Kofford Books, 2015), 285–289 likewise discusses the strangeness of the episode and contextualizes it with a Mesoamerican background. This is a conjectured reading from Royal Skousen, ed., The Book of Mormon: The Earliest Text (New Haven, CT: Yale University Press, 2009), 342. The current LDS edition reads: “he slew none save it were their leader with his sword.” In the printer’s manuscript (the earliest surviving version of this text), “with t/his sword” is written in as a supralinear emendation from Joseph Smith in 1837. See Royal Skousen and Robin Scott Jensen, eds., Revelations and Translations—Volume 3, Part 1: Printer’s Manuscript of the Book of Mormon, 1 Nephi–Alma 35, The Joseph Smith Papers (Salt Lake City, UT: Church Historians Press, 2015), 446–447. For Skousen’s reasons for emending the text, see Royal Skousen, Analysis of Textual Variants of the Book of Mormon, Part 3: Mosiah 17–Alma 20, The Critical Text of the Book of Mormon, Volume 4 (Provo, UT: FARMS, 2006), 1972–1975. See, for example, Alonzo L. Gaskill, Miracles of the Book of Mormon: A Guide to the Symbolic Messages (Springville, UT: Cedar Fort, 2015), 198–203; Alonzo L. Gaskill, “Ammon and the Arms of the Lamanites: Have we Been Misreading the Book of Mormon?” Restoration Studies 15 (2014): 82–94. Gaskill, Miracles of the Book of Mormon, 202. John M. Lundquist and John W. Welch, “Ammon and Cutting Off the Arms of Enemies,” in Reexploring the Book of Mormon: A Decade of New Research, ed. John W. Welch (Salt Lake City and Provo, UT: Deseret Book and FARMS, 1992), 180. Cyrus Gordon and Gary Rendsburg, The Bible and the Ancient Near East, 4th edition (New York, NY: W.W. Norton, 1997), 179–180. See Lundquist and Welch, “Ammon and Cutting Off the Arms,” 180–181; Gordon and Rendsburg, The Bible and the Ancient Near East, 179–180, 187 n.6; Crouch, War and Ethics in the Ancient Near East, 120–121. Generally dated to the mid-16th century, “Many of the myths outlined in the text have antecedents in the art and religious beliefs of the people of Mesoamerica dating back some two thousand years prior to the transcription of the manuscript by its K’iche’ authors.” Allen J. Christenson, trans. and ed., Popol Vuh, The Mythic Sections—Tales of First Beginnings From the Ancient K’iche’-Maya, Ancient Texts and Mormon Studies, no. 2 (Provo, UT: FARMS, 2000), 25. Christenson would go on to say, “There is value, therefore, in careful reading of the text from an LDS perspective, in that it reveals ancient theological concepts current among the people of Mesoamerica at a time contemporaneous with Book of Mormon history” (p. 25). Christenson, Popol Vuh, The Mythic Sections, 59. Compare Dennis Tedlock, Popol Vuh, The Definitive Edition of the Mayan Book of the Dawn of Life and the Glories of Gods and Kings (New York, NY: Simon and Schuster, 1986), 92. See V. Garth Norman, Izapa Sculpture, Part 1: Album, NWAF Papers, no. 30 (Provo, UT: New World Archaeological Foundation, Brigham Young University, 1973), plates 41–42; V. Garth Norman, Izapa Sculpture, Part 2: Text, NWAF Paper, no. 30 (Provo, UT: New World Archaeological Foundation, Brigham Young University, 1976), 132–137. For dating of the Izapan monuments, Norman, Izapa Sculpture, Part 1, 1 dates them to between 300 BC–AD 250. However, site excavators argued that they most likely date to the earlier part of this period, most likely ca. 300–50 BC, with some possibly dating to as late as AD 100. See Gareth W. Lowe, Thomas A. Lee Jr., and Eduardo Martinez Espinoza, Izapa: An Introduction to the Ruins and Monuments, NWAF Papers, no. 31 (Provo, UT: New World Archaeological Foundation, Brigham Young University, 1982), 23. Yerman, “Ammon and the Mesoamerican Custom of Smiting Off Arms,” 44–47. Yerman, “Ammon and the Mesoamerican Custom of Smiting Off Arms,” 46. Bernal Díaz del Castillo, The Discovery and Conquest of Mexico, 1517–1521, trans. A.P. Maudslay (London, Eng. : Broadway House, 1928), 570. Yerman, “Ammon and the Mesoamerican Custom of Smiting Off Arms,” 47. Lundquist and Welch, “Ammon and Cutting Off the Arms,” 180. Robert L. Millet and Joseph Fielding McConkie, Doctrinal Commentary on the Book of Mormon, 4 vols. (Salt Lake City, UT: Deseret Book, 1987–1992), 3:130. Lundquist and Welch, “Ammon and Cutting Off the Arms,” 181. D. Kelly Ogden and Andrew C. Skinner, Verse by Verse: The Book of Mormon, 2 vols. (Salt Lake City, UT: Deseret Book, 2011), 1:424.